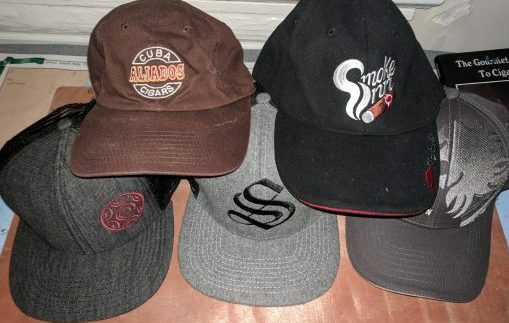 I was recently perusing the extensive StogieGuys.com archives when I came across this tidy piece from 2010 by one of my colleagues. In typical George E fashion, it is as insightful as it is concise. Indeed. It’s easy to get caught up in the bustle and excitement of new cigars, especially in the month or so following the IPCPR Trade Show. So why not take some time this spring to re-acquaint yourself with an old favorite or two? With this in mind, there were many, many cigars I could have chosen to write about today. 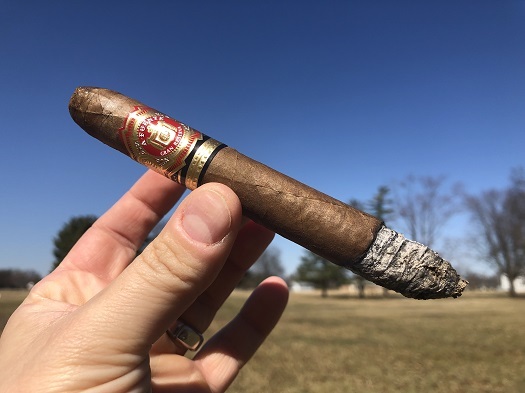 But—with a nudge from Holt’s Cigar Co., who generously provided the five-pack for this review—I landed on the Arturo Fuente Hemingway Signature, a perfecto measuring 6 inches long with a ring gauge of 47 and a per-cigar price of $8.30 (or $185.95 for a box of 25). Handmade at Tabacalera A. Fuente y Cia. 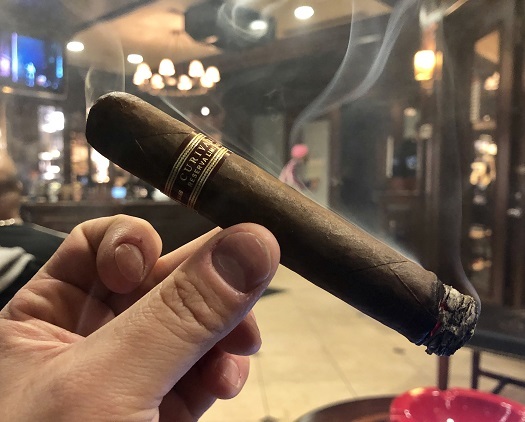 in the Dominican Republic with a Cameroon wrapper around Dominican binder and filler tobaccos, the Hemingway Signature is a dry, pale brown cigar with a narrowed foot and the classic Fuente band of gold, red, and black. Most of the visible veins are what I’d call thin or nondescript, rendering the cigar relatively smooth—though not without a few bumps and wrinkles here and there. The pre-light aroma is faint with notes of hay and pepper. And despite finding a very tight cross-section of tobaccos at the head after clipping it, the cold draw is easy. Now some cigar enthusiasts will actually clip the narrowed foot before lighting, presumably to ensure an even light at the cigar’s widest point right from the get-go. I don’t understand this. The Hemingway Signature lights easily and evenly with one wooden match. As for flavor, the mild- to medium-bodied profile starts dry, woodsy, and very sweet. Individual notes include cherry, white pepper, molasses, and cream. On the finish, the sensation is spicier. The flavors remind me of cedar and cayenne heat—both of which nicely complement the sweetness of the core profile. This taste is remarkably consistent from light to nub. Construction-wise, the physical properties are aligned with what I’ve come to expect from Arturo Fuente. The burn is even throughout with no need for any touch-ups along the way, the draw is smooth, the ash holds well off the foot, and the smoke production is about average. 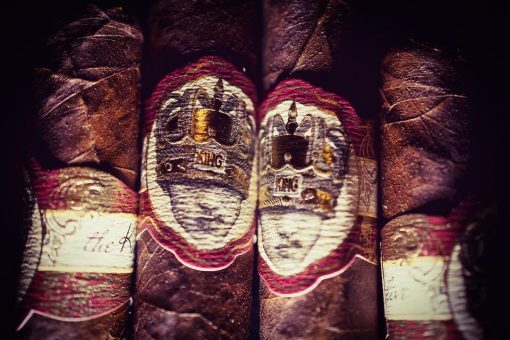 The Arturo Fuente Hemingway Signature has stood the test of time, and for good reason. At an affordable price, you get classic medium-bodied flavors, well-aged tobacco, superb combustion qualities, and a nice interplay between the sweetness of the flavor and the gentle spiciness of the finish. For that, I award it four stogies out of five. When My Father Cigars introduced the Connecticut in 2014, Janny Garcia told Cigar Aficionado it was “the one cigar that was missing in our lineup.” Apparently, it still is. It didn’t show up in the listing of “our brands” on the My Father website. Nonetheless, it’s well worth checking out. With a beautiful light brown Ecuadorian Connecticut wrapper and binder and filler tobaccos from the Garcia’s Nicaraguan farms, it’s a mild cigar that has plenty of taste, even starting with a little pepper. The blend is creamy, smooth, and well-balanced. I smoked the Toro Gordo (6 x 60) because it was the only vitola available at the shop I visited. I’d prefer a smaller ring gauge (like the Robusto pictured), but it certainly wasn’t a deal-breaker. As whisky grows in popularity, limited edition whisky releases grow even faster. You’d be hard-pressed to go a week or two without multiple new bourbons, ryes, or single malts being announced. Increasingly, I don’t bother trying to track down these limited releases. The price and/or rarity makes it not worth it, with only a few exceptions: either because they are reliably good for the money, or because something about the offering is particularly interesting. Given my appreciation for Ardbeg’s Uigeadail (a high-proof release that shows off the results of Ardbeg’s peat in sherry casks), I was particularly interested in Drum, which for the first time put Ardbeg Single Malt into American rum casks (reportedly rum casks from the Guyana distillery where El Dorado is made). This year’s Ardbeg Committee Release ($120) weighs in at 52% ABV. Exact aging details aren’t disclosed except that the whisky is aged in ex-bourbon casks for a period before secondary aging in rum casks. The resulting sprit is pale in color and slightly murky in appearance. The nose is a hint of what’s to come with light smoke, brown banana peel, and red hot candies. The palate is a classic Ardbeg peaty profile (gritty smoke and petrol) with added lavender, anise, pear, and hints of pineapple. The finish is long and complex with pine smoke, cinnamon, lemon, and leather. It’s a complex offering that shows off a subtle complexity from the rum barrel finish. Frankly, while I enjoyed it, I was hoping the rum element would be a little more prominent, but that is more because of my affinity towards single malts that combine peat and sweet (more traditionally from sherry casks). For fans of the entire Ardbeg line, this (or the forthcoming $100 non-Committee Drum release) is an offering worth seeking out. For those just dabbling in Ardbeg’s offerings, I’d recommend trying Uigeadail and Corryvreckan, which are both more complex and more affordable ($70-80). Like most peaty single malts, a mild cigar will get lost next to Drum, so stick with something more flavorful. 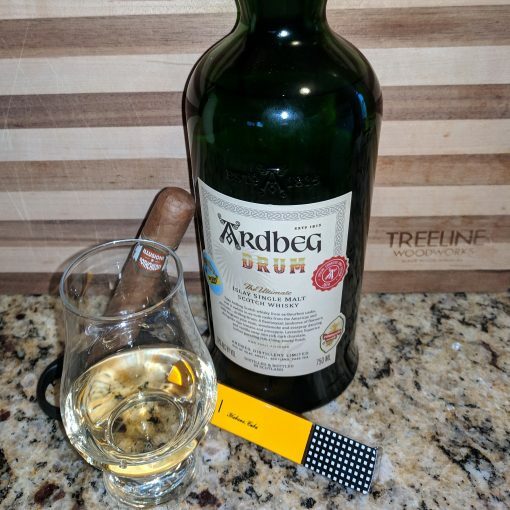 I particularly enjoyed the My Father and Paul Garmirian 25th Anniversary paired with the Ardbeg Drum Committee Release. For years, my colleague has praised the Buenaventura line by Curivari as not only an excellent smoke, but an excellent value. 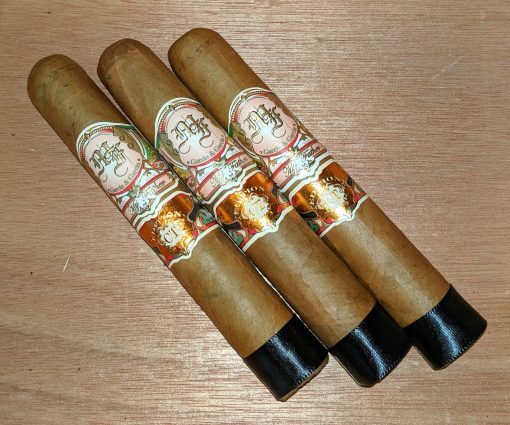 The cigars—which sport a classic, Cubanesque presentation and have been well–reviewed at StogieGuys.com on numerous occasions—also retail at a very refreshing price point. To this day, when people ask me to recommend an inexpensive cigar that punches above its weight, Buenaventura is usually on the short list. Still, Curivari doesn’t seem to receive the attention it deserves. Perhaps this is due to its (seemingly purposeful) low profile. In stark contrast to many other boutique brands that employ social media to create a personal connection to between their customers and cigar makers or owners, Curivari’s owner—Andreas Throuvalis—operates behind the scenes, rendering the brand almost faceless. The Curivari Café line is described as “medium- to full-bodied… with lots of coffee and cocoa undertones.” It is offered in three sizes: Petit Café (4.5 x 42), 60 (5.5 x 58), and 52 (5 x 52). The 52 retails for $8.25. This Nicaraguan puro boasts soft notes of hay and cedar at the unlit foot. It is spongy to the touch with moderate oils on its smooth, seamless surface and an understated band of sepia and gold. Notably, the filler and binder extend a bit beyond the wrapper. The cold draw is easy with a hint of oaky sweetness on the lips. After an even light is established, the initial puffs are salty, dry, and loaded with spicy cedar and cinnamon. The spice, while still present, backs off quickly, leaving behind notes of café au lait, cocoa powder, and a little cashew. Throughout, the burn line is less than stellar, and several touch-ups are needed to keep things even. Every other aspect of combustion, however, is admirable. The gray ash holds pretty well off the foot, the draw is clear, and the smoke production is generous. The final third of the Curivari Café 52 isn’t much different than the rest. Expect cedar spice, cocoa, some cinnamon, coffee, and dry earth. The next time I try this robusto I may sample it with a limoncello gin martini, a citrus rye and ginger, or simply a Cuba libre. On its own with nothing but water, it earns three stogies out of five.